BNC San Dieguito is happy to announce our March bulletin is now available! This month’s big event is the Fashion Show and Tea, on March 18th. Reservations are due by March 12th and the form is in the bulletin. Check out the bulletin here! From December 6th to 12th, Nobel laureates from around the world gathered in Sweden to receive their awards. During the week known as Nobel Week, winners attended dinners, ceremonies, and concerts in their honor. They met Swedish royalty, delivered lectures to be broadcast across the globe, and received their Nobel medals and diplomas as VIP guests of the Swedish government. Swept up in the excitement were Michael Rosbash and Jeff Hall, biologists from the Brandeis community. Rosbash, currently a professor in Brandeis’ biology department, and Hall, a professor emeritus of biology, won the Nobel Prize in Physiology or Medicine along with Michael Young of Rockefeller University. While winning the most prestigious prize in the world and the various perks that come with it (such as a personal attaché, first-class trip to Sweden, and intellectual celebrity status) is exciting, it is far from the main reason for Rosbash and Hall’s work. Their discovery of the fundamental workings of the circadian rhythm have far reaching implications, especially in the medical world. The circadian rhythm, also known as the body clock, has connections to many bodily functions including sleep cycles, hormone balances, enzyme production, body temperature, and metabolism. This internal clock is also connected to several neurodegenerative diseases. Studies have linked chronic sleep disorders with higher levels of proteins associated with Alzheimer’s, while Parkinson’s is often marked by sleep disorders. Three quarters of patients with Parkinson’s disease have a sleep disorder and disordered sleeping may be an early indicator of the disease. It is necessary to understand the body’s underlying workings in order to develop targeted treatments. Foundational research like Rosbash and Hall’s is critical for advancing medical knowledge. As the scientific and medical communities, and the world acknowledge the significance of Rosbash and Hall’s discovery, the two biologists recognize Brandeis University’s role in their research as a whole. Not only was Brandeis the place they met, but its collaborative, intellectual environment and financial support allowed them to perform critical research. In a time when pharmaceutical companies rely heavily on research coming out of universities; government funding for scientific research is more competitive than ever; and research in flashier, more profitable areas is more attractive; Brandeis provides a haven for an exploratory approach to the base questions, without which we can never fully answer the bigger questions. Brandeis University’s attention to foundational research and specialization in neuroscience fosters an environment of research and discovery for both faculty and students. Cognizant of the costs of research, the University provides financial support in the form of grants, fellowships, and scholarships, allowing minds like Roshash and Hall’s to stretch and push the limits of conventional science. We must also recognize the role the Brandeis National Committee plays in Brandeis’ science. Through funding campaigns, and general support for the libraries and scientific journals, BNC members ensure Brandeis scientists have access to the resources and stability necessary to perform quality work. The Sustaining the Mind Fund for research in neuroscience and neurodegenerative diseases and scholarships in science specifically targets the needs of Brandeis’ science departments. Without the generous support of BNC members research into these diseases and progress towards their treatment and cure would be significantly slowed, and the future less secure. So in addition to congratulating Michael Rosbash and Jeffrey Hall on their Nobel Prize, the Brandeis community and the Brandeis National Committee would like to recognize the role our members play and extend our thanks for your support in this meaningful discovery. Enjoy a trad itional British tea and a fashion show with our own member models, featuring items from Weeds on Cedros and Satori Designs, a silent auction, and boutique vendors, all to benefit the BNC Sustaining the Mind Fund. Tea, albeit early afternoon, will include assorted finger sandwiches, fruit, cheese with dry fruit and crackers, and dessert including assorted petit fours, scones with clotted butter and jam, and tea, iced tea, coffee. Free valet parking (no tipping) included. Mail your $40 ($15 is contribution) check made out to BNC to Suzie Kaplan, 6991 Batista St., San Diego 92111 by Mar. 12. Director Lilly Rivlin will be guest speaker at this screening. This documentary, in English, won three Israeli Academy Award nominations and best cinematography award at the Haifa International Film Festival. Heather Booth is the most influential civil rights organizer you have never heard of. Participants in this eye-opening documentary include Gloria Steinem, Elizabeth Warren, and President Barack Obama. Wherever there was a fight for equality, Heather Booth was there: from her start as an organizer living on a kibbutz in Israel to helping create the Consumer Financial Protection Bureau. Ms. Booth is, simply put, America’s conscience. Mail your check for $11.75 (made out to BNC) by Feb. 2 to Sue Berger, 7420 Magellan Street, Carlsbad, CA 92011. Please enclose a stamped self-addressed envelope in order to receive your tickets. This promises to be one of the most entertaining UOW presentations in years when Professor Ryan McKittrick, Assistant Professor of Theater Arts, presents The American Musical from the 19th Century to “Hamilton”, illustrated with scenes from famous film adaptations and clips from recent productions. Ryan McKittrick teaches dramatic literature, American musical theater, dramaturgy and playwriting at Brandeis. He is also Director of Artistic Programs/Dramaturg at the famous American Repertory Theater in Cambridge, where he has served as lead dramaturg on more than 30 productions of plays, operas and musicals. Please send a check made out to BNC for $55, $65, or $75 (which allows you to sit with Professor McKittrick) to Suzie Kaplan, 6991 Batista St., San Diego 92111 by Dec. 29. Watch for more information – the menu – and a reservation form. Tax deductible amounts: $15, $25, $35; all proceeds will support the Sustaining the Mind Fund. As our DreamKeepers community service project, we will be collecting for the children living at the Family Recovery Center in Oceanside. Please be generous and bring a donation to the luncheon. Here is their partial wish list: diapers, formula, baby foods, layettes for newborns; clothing such as socks, underwear, pajamas for infants, toddlers and kids up to age 10; new toys, books, art supplies. Thank you! 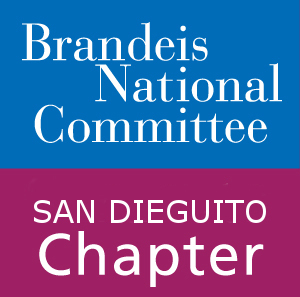 We are excited to announce the BNC San Dieguito November-December Bulletin has arrived! Inside you’ll find it packed full of event details and forms, chapter news, save-the-dates, member news, contact information, and community outreach opportunities. Featured events include the University on Wheels event topic announcement and a Sunday Brunch. Let’s try something new; a progressive brunch! Join us on Sunday, December 3rd at 11:00 a.m. for 3 yummy courses in 3 lovely homes while surrounded by good company. Everyone will gather for appetizers and drinks at the home of Kay Weiner in Carlsbad. The main courses will be served at various nearby homes in the Encinitas – Carlsbad area (addresses TBA). For dessert we will come together again at the home of Iris Kanter and Mitch Friedman in Carlsbad. This event is open to all and we encourage you to invite your spouse and friends! Left to right: Michael Rosbash and Jeffrey C. Hall. Photo by Mark Lovett. 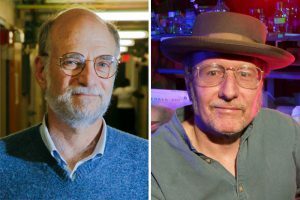 On October 2nd the Nobel Prize in Physiology or Medicine was awarded to Michael Rosbash, Jeffrey Hall, and Michael Young for their research on circadian rhythms. This year’s award is especially exciting as Rosbash and Hall share a history of teaching and research in Brandeis’ biology department in addition to being the first long-term Brandeis faculty to win the Nobel Prize. Rosbash, whose research continues in the labs of the Carl J. Shapiro Science Center, is a current professor at Brandeis while Hall has retired to Maine. Young is currently on the faculty of Rockefeller University. Rosbash and Hall met at Brandeis in the 1970s striking up a friendship over basketball. This friendship evolved into a working partnership in the biology labs researching circadian rhythms using fruit flies as a model organism. The work that won them the Nobel Prize was the discovery of molecular mechanisms that control the circadian rhythm. The circadian rhythm, colloquially known as the biological clock or body clock, is the 24-hour physiological cycle that regulates certain internal processes. It plays a role in when we go to sleep, wake up, and feel hungry, as well as hormone balances and other brain activity. In 1984, Rosbash and Hall successfully sequenced the per gene which led to discovering its control over PER protein production. The per gene triggers the production of messenger RNA (mRNA) which carries information out of the cell nucleus. The information from the mRNA triggers PER protein production which peaks just before dawn and then declines until the protein is undetectable by night time. PER protein molecules then travel back into the nucleus, repress their own synthesis, and degrade. The decay causes the per gene to make mRNA, beginning the cycle over. The process was a mystery until Rosbash and Hall came along and connected the dots. Understanding the mechanisms behind the circadian rhythm has opened the door to a host of possible applications. Some mental illnesses, Alzheimer’s, heart disease, and diabetes have been linked to issues with the circadian rhythm. Rosbash and Hall’s work could potentially lead to better treatments for these diseases as well as applications in plant science and environmental science. Both men commented on Brandeis’ unusually collaborative atmosphere which allowed for such scientific innovation. The school’s small size and interdisciplinary values encourage interaction between departments resulting in collaborations drawing from many sources. Rosbash also acknowledged the hard work, creativity, and brains of Brandeis students in his work, undergraduate as well as graduate. Brandeis students of all levels often have the opportunity to work alongside professors on ground-breaking research, a chance students at many other schools only get at the graduate level. Rosbash, who regularly hires around 12 students a year, is known around the lab as a wonderful mentor with a knack for fostering talent. The Brandeis National Committee would like to congratulate Michael Rosbash and Jeffrey Hall on their win, and warmly thank our members for your continued support of Brandeis, its libraries, sciences, and scholarships. Your support makes it possible for students to learn from the great minds of today, such as Rosbash and Hall, and work towards the solutions of the future. Read more about the professors in Brandeis NOW. Read the Nobel Prize press release. Join us for a fun, relaxing, educational day as we tour Liberty Station. Liberty Station originally served as a military base as the Naval Training Center, San Diego (NTC), welcoming its first recruits in 1923. Since then the NTC expanded employing the Spanish Colonial Revival style for its buildings, which have been preserved today. After the NTC’s closing in 1997 the area slowly began to transition into the art, culture, commerce and culinary hub we know today. Throughout our day we will visit museums, enjoy a lunch together, and have some shopping time among Liberty Station’s extensive selection of attractions, restaurants, and boutiques. We are able to provide transportation for this event. If you would like a ride please reach out to Sondra Albers. Any further questions should be directed to Phyllis Perkal. To reserve your spot on this excursion, please send checks to Barbara Howard. Further details can be found in the September-October Bulletin. Tour of the Family Recovery Center – Monday, September 11 at 1:00 p.m. The chapter’s Board has adopted DreamKeepers as our community service project for this year. DreamKeepers is a volunteer organization, a support group, which helps provide for the daily needs of mothers and children who live at the Family Recovery Center in Oceanside. For more information, to RSVP (by Friday Sept 8), or to arrange carpools or delivery of your contribution, please contact Community Service Chair Judy Winter at judithfwinter@hotmail.com or (858) 794-0538.